Imagine long walks in front of a wonderful winter landscape surrounding the Molveno Lake and the Brenta Dolomites in winter, peace, harmony , nature, and then back into your home at the Residence San Carlo. 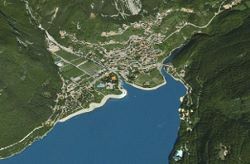 The environment of Molveno is particularly suitable for those who want to enjoy nature, away from the noise of the ski areas, without necessarily having to do without it. The Paganella ski resort in Andalo is only 5 miles away from our apartment house and is easily accessible with the convenient and free ski bus service for our customers, offering 50 kilometers of groomed slopes for all levels, cozy cottages, modern lifts and fun in the different snow parks. Come visit us, Molveno and its enchanted lake are waiting for you!